Wick Amateur Swimming Club finished off the swimming year with a fun gala and the club championships. The fun gala was for younger swimmers just starting their swimming career and a series of fun races let them show off their new found skills and have great fun at the same time. The annual club championships were a much more serious event with over 60 swimmers competing at 4 different age groups for medals and trophies. The swimmers raced over the four individual strokes to decide the overall winner with a separate trophy going to the winner of the 100m Individual Medley. At the 9 and under age group Ben Sinclair, Robbie Gunn and Grant Aitkenhead are finely matched with all their races over the shorter 25m distance being decided by fractions of a second. When the dust had settled Ben won 2 golds for back and Fly and also two silvers to win the overall age group just ahead of Robbie who had won gold in the free and breaststroke along with a silver and a bronze. Also achieving places at this age group were Cameron Carter, Angus Hendry and Jack Gill. For the girls Morven Coghill was in fine form winning the front crawl and butterfly with silvers in her other two strokes to take the overall award. Morven did not have everything her own way with Carly Sinclair winning gold in the breast stroke along with Silver for her front crawl. Bryony Munro was the winner of the back stroke and she also came 4th in her freestyle. Emma Hamilton and Sarah Hamilton also won a place on the podium at this age group. Scott Bremner swam well to take the gold in the boys 10/11 age group but in the other events could not stop an impressive performance by Stewart Atkins who won the other golds for fly, Back and breaststroke. Darren Taylor did well to win silver in the free and breaststroke and Declan Gunn did well to take the Silver in the backstroke. Ian Fishenden continues to improve with bronze in the free and breast as well as a 4th place for his backstroke. Ross Gunn swam well to take 4th in the free and breaststroke. For the girls Ashley Bartholomew was in unstoppable form with a clean sweep of gold medals. Katie Coghill was never far behind with silver medals for the free, back and breaststroke with Gemma Sutherland producing a fine butterfly swim to take the silver along with two bronze medals. Isla Miller and Ashlyn Sinclair also did well to win medals in a competitive age group. For the 12/13 age group there was another clean sweep of medals this time by Fraser Tait who also set 2 new meet records on the night for fly and freestyle. Both Scott Gunn and Ross Perry both pushed Fraser hard and took 2 silver medals each with Ryan Edwards also competing well at this age with 2 bronze medals. For the girls Stacey Webster swam well to win gold in the free, back and fly events along with silver for her breaststroke. Stacey was pushed all the way by Carla Bartholomew who finished the night with three silvers and a bronze. Robyn Aitkenhead got her reward for all her hard training with the gold for her breaststroke. Jade Sinclair also won a place on the podium. For the senior boys Christopher Manson was in fine form with 3 gold medals which included two new meet records for his front and back crawl. Scott Taylor prevented the clean sweep with gold in his butterfly as well as winning silver medals for his other swims. Sweyn Linklater and Mathew Sinclair both competed well to also win medals. For the girls there were some competitive races with Shannon MacKenzie and Stephanie Webster producing some close finishes with Stephanie taking 3 golds and Shannon one gold for the breaststroke. Eve Strachan and Robyn Hughes also did well to get places on the podium. Swimmers then had to muster one more effort to race in the 100m individual medley to show their all round ability over the four strokes. After some close races the winners were 8/9 age group boys, Ben Sinclair. 10/11 age group boys- Stewart Atkins, girls - Ashley Bartholomew. 12/13 age group, boys Fraser Tait, girls - Stacey Webster. 14 and over boys - Christopher Manson, girls - Stephanie Webster. Note - no girl's winner at 8/9 age group. 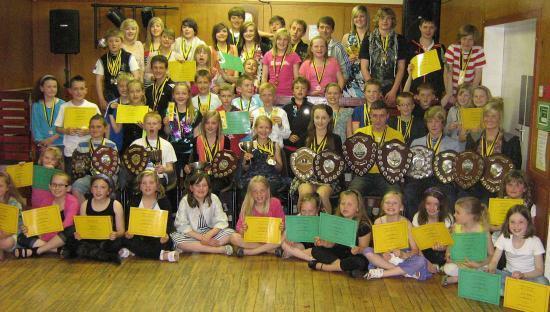 The medals and trophies were then presented at the club's end of year disco at Staxigoe Hall. The club are very fortunate to have a growing band of people who offer their services despite no longer having children swimming in the club. Three of these people, Valerie Gerrie, Fiona Bremner and Kenny Shuttleworth were on hand on the night to make the presentations. The coaches and swimming are now enjoyed 2 weeks holidays before swimming resumed on the 18th of July 2011.